At Floors Direct Carpet One, we are proud to offer more than quality flooring options; we also offer additional home products such as window treatments. Our featured window treatment brand is Hunter Douglas, which certainly provides one of the industry’s best and most highly sought-after selections. Let’s take a closer look at Hunter Douglas to see why it continues to be the first choice among homeowners. We are happy to offer a full line of products. What Can Hunter Douglas Do for Your Home? Hunter Douglas can improve the functionality of your home, and make your life easier. Since 1946, Hunter Douglas has been providing light and privacy control for homes everywhere. Today, Hunter Douglas is an industry leader thanks to their aesthetic designs and reliable window treatments. Hunter Douglas keeps the needs of every homeowner in mind when it comes to their window treatments. Not everyone is going to want complete privacy or blackout shades, and Hunter Douglas understands that. By designing a variety of window fashions, Hunter Douglas offers styles that range in price, material, and level of light control. Light control varies from room darkening and blackout shades to sheer shades that allow in a substantial amount of light. Privacy is similar to light when comparing window treatments. You can choose from extreme privacy or allow people to see in windows if you prefer. Hunter Douglas offers products that fit your needs, and we are here to help! Blinds offer both privacy and openness due to their construction. They usually come in metal, wood or plastic, and can be opened or closed easily to allow the maximum view of outside. Vertical blinds are also popular and can be used for sliding glass doors. Shades are usually made of a soft material and come in either roman or cellular options. Filtering sunlight through shades is easy due to their soft, sheer, material. Luxurious textures are available to suit the design of your home. Shutters are ideal for emphasizing the natural, beautiful windows in your home by adding a classic, timeless flair. They are made in many different materials and can add fresh style to your home design. Shutters are easy to clean and quite functional when it comes to light control and privacy. What if you could control your treatments from wherever you’re at? With PowerView™ you can! Treatments connect to a smartphone and can be set to raise and lower at a specific time or with the sunrise and sunset. 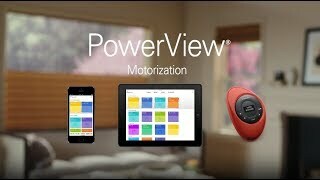 PowerView™ motorization is the ultimate in window treatment technology.